2 Bedroom Terraced House For Sale in Stratford-upon-Avon for Offers Over £180,000. A must be seen! Not your normal two bedroom home within Lower Quinton. What makes this modern home special is the open plan accommodation that the current owner has given this home by removing the wall between the sitting room and kitchen allowing a dual aspect, light and airy area. Occupying a quiet position within the popular village of Lower Quinton between Stratford and the Cotswold borders. 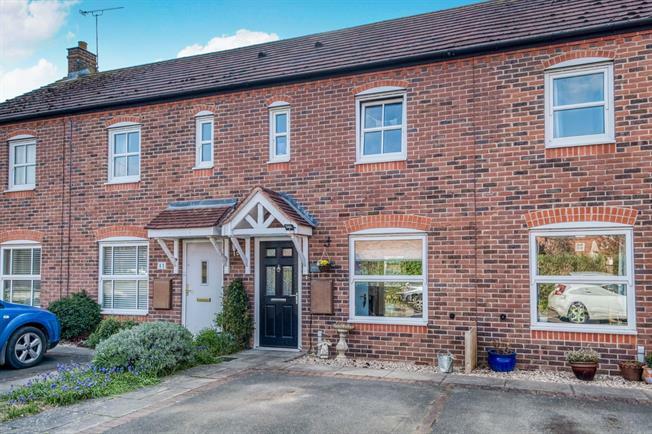 The accommodation is presented to a high standard and allows; entrance hall, cloakroom, open plan sitting, breakfast kitchen area with a door opening to the garden. Upstairs are two double bedrooms and a bathroom. Outside is an enclosed garden and parking for two cars to the front. Viewing is advised. Acessed via a hardwood door. Tiling to the floor. Radiator. Double glazed window to the front elevation of the sitting room and the rear elevation of the kitchen and door to the garden. Laminate to the floor. Stairs rising to the first floor leading from the sitting room. Range of matching wall and base units including rolledge work surfaces incorporating a stainless steel sink and drainer. Integrated is a four ring electric hob and oven. Space for a American fridge freezer, washing machine and dishwasher. Airing cupboard housing the hot water tank. Loft access. Radiator. Two double glazed windows to the rear elevation. Two built in wardrobes. Laminate to the floor. Radiator. MAX. Double glazed window to the front elevation. Radiator. White suite allowing a low level w.c, wash hand basin and bath with shower over. Tiling to the walls and floor. Radiator. Ease of maintenance with a decked and pebbled area. Enclosed by fencing and a rear gated access.